Those born with a great intellect and a creative mind are considered lucky. Those who grow up in an environment which enhances their best qualities are considered very lucky indeed. Albert Einstein was lucky enough to have had both. headline shows not just a fine mind but a mind with a high level of concentration and mental stamina, which is as important as intelligence. The curved, well developed Mount of Moon reveals immense creativity. It is the Middle Mount of Moon which is the most developed, and when combined with his kind of headline, tells the tale of an inventor. willpower, and a sense of direction. Einstein had that too and in plenty (long, strong thumb). These qualities invariably produce someone who leads the world with his ideas. Check out a hand photograph of his here. The photograph published on this post is a free photo which does not require attribution. His hand also shows musical talent and a love of music, which Einstein could have developed if he had wished to. His headline shows the versatility of his intellect. On his left hand (which shows inborn qualities) it is his upper mount of Moon which is more developed, which means that had he been born in an environment in which his father was a musician, Einstein would have become a famous composer of music. However, he did not develop this side of his nature. 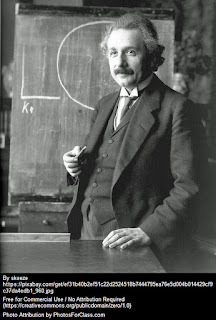 Einstein was down to earth and broadminded (shown by his headline and shape of hand) with a strong inner belief, confidence and independence (strong Jupiter finger and the way his Life and Headlines commence). The shape of his fingers tells us of his quickness, adding to his brilliance. This in combination with the strong natural health shown by his Lifeline makes him a doer. The well-shaped fingers tell us that Albert Einstein was a straightforward person who would not know how to manipulate and/or scheme. In any case, he was too focused on his work (Headline, Saturn finger) to bother with petty matters. 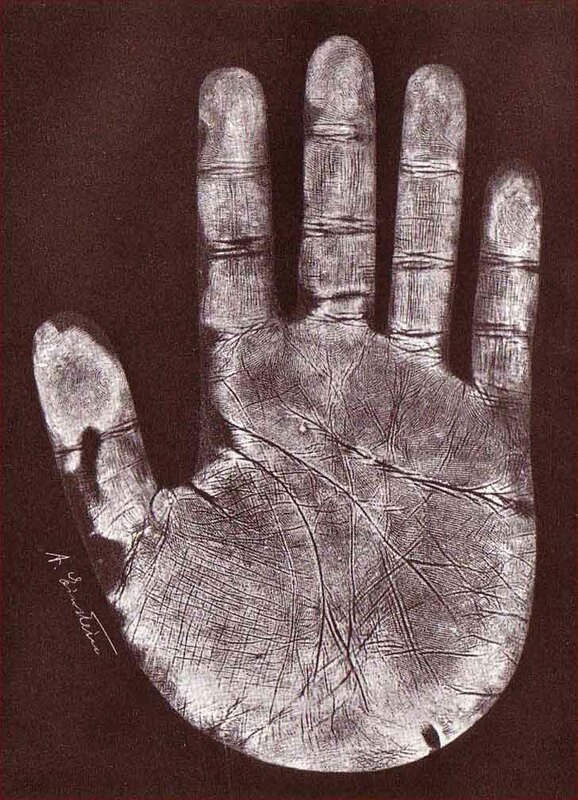 The shape of Einstein's palm, with the heaviness at the bottom, as well as the fork at the beginning of his long heartline tells us that he was of a warm ardent nature, his sexual side well developed. He had strong Venusian qualities, and Venus gives passion, geniality, sympathy and warmth. Money usually means little to those with a strong Mount of Venus (if other signs don't contradict). The non-materialistic aspect of Einstein's character is confirmed by the shape of his Apollo and Mercury third phalanges. This strengthens the reading that he lacked interest in symbols of power and status, and did not have a penchant for gathering wealth. The sloping headline, particularly after mid-life, is a further confirmation of his non-materialistic nature. Einstein’s Headline also shows that his thinking changed in his late thirties. He kind of retreated into his own world, moving further away from the material world. It is around this age that he started to become famous and it was around the age of 40 that he won the Nobel prize. It is possible that as he achieved world recognition, he absorbed himself further in his work and worldly matters or day to day life did not concern him too much. Related Reading: Find out what made Bill Gates the successful entrepreneur that he is or the qualities that made Steve Jobs take Apple to where it is today or find out about APJ Kalam, a famous Indian scientist turned politician. It is interesting what you said about his musical ability. A lot of our talents are not developed due to the way we are brought up. It makes one wonder which is more important, nature or nurture? Well eventually it is the environment, isn't it? I mean, without the right environment the most talented people will go to waste. And a talent can also be built up from scratch. It may not be up to the level of someone who had the advantage of both nature and nurture, but it will certainly be better than someone who had only nature. When you consider astro, palmistry etc etc..you do begin to wonder if there is a big scheme going on..
Violin huh. Not surprised at all! And whats that scheme that you mean? Didn't get it. I am not sure if talent can actually be built up from scratch... even if it can, its going to be very difficult. If a person is born in a family where no one sings or practices any form of music, its going to be very difficult for that person to be a good musician. So, I think even inheritance (of skills by birth) is also a crucial factor. Albert Einstein is one of my most favorite personalities - he has gone very close to the truth with his Relativity Theory than anyone else in this world. Certain types of talent can be very difficult to build up from scratch, as you mentioned. And ofcourse without the right environment its impossible. There are certain skills which are easier to develop in the right environment. Why do you say that Einstein's thinking changed in his late 30s? The headline shows the type of mind one has and any changes in it show changes in thinking. If you notice his headline you will see it change its shape as it proceeds and also there are some small lines going upwards from the headline. your analysis is really very interesting. 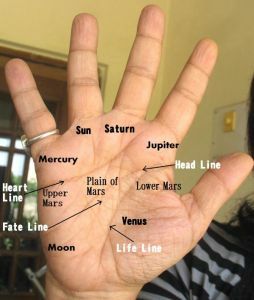 what does black moles in the palm signify? Black moles do not signify anything because they have nothing to do with palmistry or hand reading. Moles are caused by skin conditions and this has something to do with melanin in the skin. A dermatologist will have the right answer as to why moles exist, not a palmist. What determines on your hand that you would get famous? If you are asking if there is a line of fame, no there isn't. The presence of the Sunline does not necessarily mean significant fame. What do Suresh Kalmadi's hands tell us?